Do you ever worry that Google, the company, is actually run by a sentient evil-super computer bent on destroying humanity? Let's not forget that Google's main goal is an index of ALL the World's information. 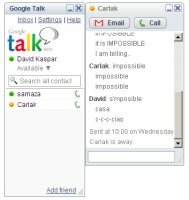 IM/VoIP has become a hugely popular tool for corporations to use to communicate official business--easier to have an IM client open with everyone in your department connected than to flash a memo or phone call--so, by offering their own tool and incorporating a feature you mentioned (Gmail like search of conversations), you have, not just an IM client, but a indexable history of business conversations. Google has yet to fall into the pit of greed, IMHO, but they continue to strive toward their goal of giving access to a varied and frighteningly enormous amount of information. so the other day i was talking to a quasi-friend of mine about googles valuation and what it portends. basically it *has* to become a heavily diversified media hub if it want's to live up to expectations. the next warner or whatever. my friend was like, "yeah, i hope it does". bollox!! google made it's name as the underdog whipping the multinational conglomerate menace (M$) by being slightly more clever**. now everyone's saying woo-hoo, i like them and hope hope they rule the world?!?"&*?£?#@?*#!! a bunch of geniuses? yes. for getting all those interns to churn out a bunch of search-derivatives devoid of any real innovation. btw: i use google constantly. guess i'm bandwagonesque. ** making a simple site right when people were realizing complexity sux. no really.